In the 2003 comedy, "CHEAPER BY THE DOZEN," Steve Martin's family ('The Bakers') moves to a new house in what is supposed to be Evanston, Illinois. But as you might expect, the house is actually in Los Angeles. It's located in the Hancock Park area (east of Farmers Market), to be exact. 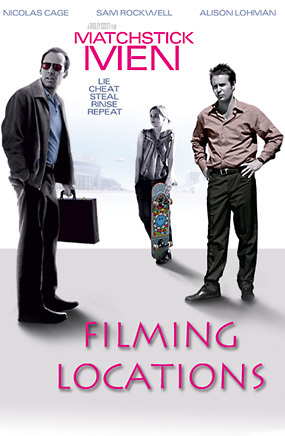 In the film, there is a fake street sign out front saying "Forest Ave - S. 300" - ignore it. There is no Forest Ave in Hancock Park. It's actually at the northwest corner of Lorraine Blvd. & 4th Street, at 357 S. Lorraine Blvd. 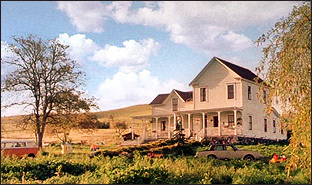 But at the start of the movie, before they move to that Chicago home, we see the big family living in a rural house in Midland. Not surprisingly, it is actually in California. But this time, it's nowhere near L.A.
You'll find the house some 425 miles to the north of Los Angeles, 50 miles north of San Francisco, in Petaluma, CA.